KitMaker Network :: Bundeswehr 1950s early 60s figures ? Bundeswehr 1950s early 60s figures ? I haven’t really come across many figures that could represent bundeswehr soldiers in the late 50s or early 60s. 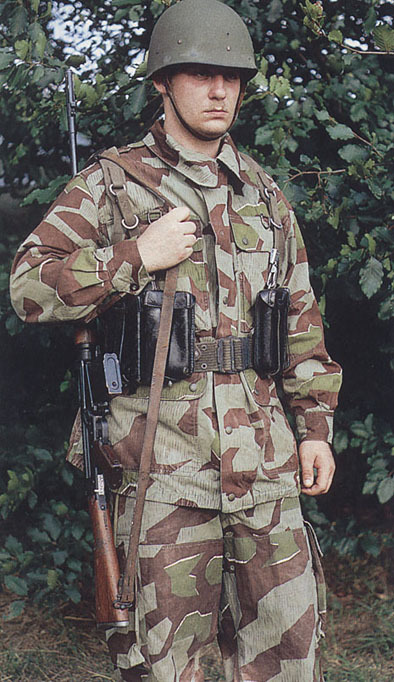 I was thinking of using the Dragon German paratroopers kit but those are 90s era soldiers. Could these possibly work or what would be the best way to mix and match kits. I know the early bundeswehr used some Wehrmacht equipment but I’m just not sure where to start. 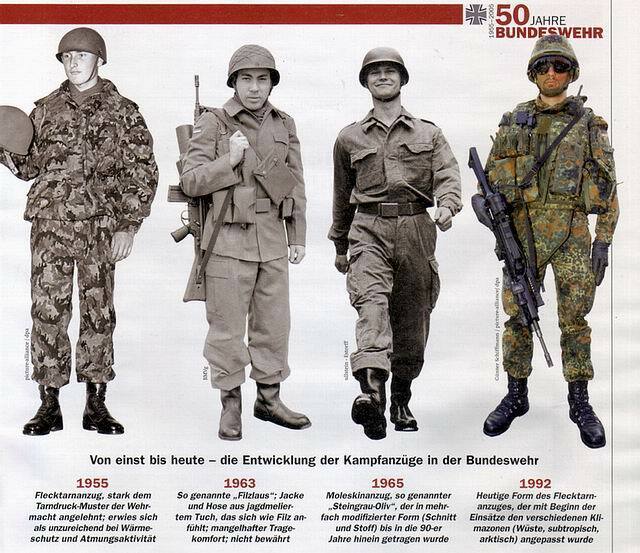 As far as uniforms, when the Bundeswehr was formed in 1955 I believe that their uniforms and equipment were predominantly American supplied. 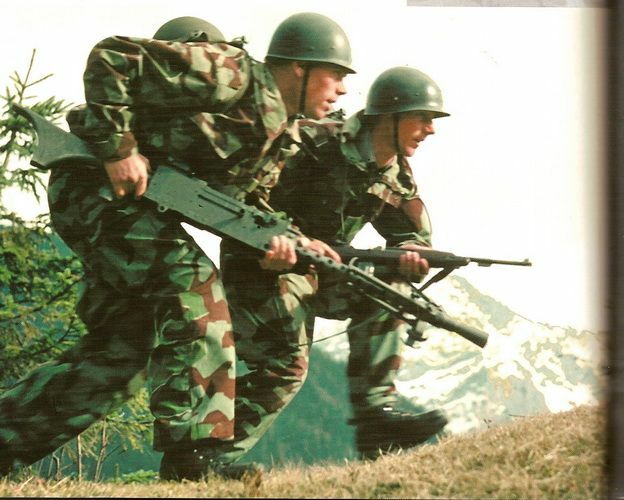 Their fallschirmjagers however appear to have still used the same pattern helmet as they did in WW2. So American uniforms from the end of world war 2 and some fallschirmjager helmets to go along with them? Find Wehrmacht figures wearing the hooded smock. 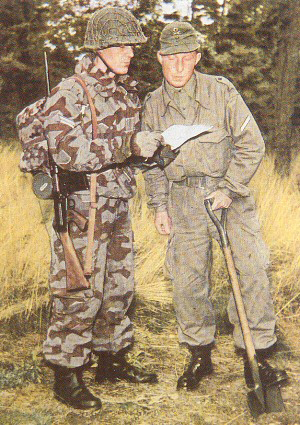 The Bundeswehr wore them into the early 1960s with US helmets. If you do rain gear or winter jackets they were nearly identical to the World War II reversible winter clothes. The rain suits were just nylon and rubber. And no berets. They came along in the mid 1960s. A coverall similar to that seen on some World War II tank crew was also seen. The main indicator of Bundeswehr was the rank insignia and the flag shoulder patch. Early on the silhouette was very similar to late war wehrmacht but then so was a lit of the leadership. The ancient Airfix 1/32 Bundeswehr modern infantry soft plastic figures are very accurate for the look of the 1970s. There are also Roco and Preiser HO scale kits that document the look of the basic uniform and helmet which go back to the beginning of the Bundeswehr. Thank you i have an idea of a few kits that may work for this! Dolp in Germany produces some Bundeswehr figures for the 1950's. This is awesome thank you. I have two tank crew figures that are metal that I’m trying to work with. I do far have an M47 built up and a destroyed T-34/85z I’m doing a what if diorama set in the late 50s early 60s.